yes little tweaks to amps can make all the difference in the world. i just have that line 6 spider 4 monster but gibson had posted how to tweak amps for overdrive using amp controls so i followed the directions and its amazing just moving drive and volume around the different sounds you get. can you see if that photo is online and post it here if your not to busy ? Is this it? 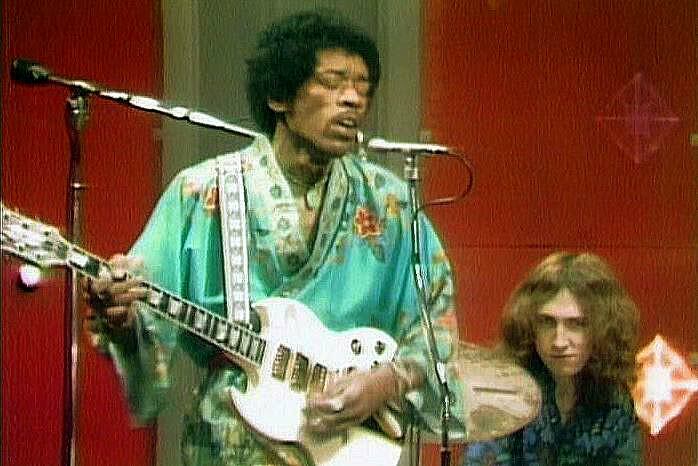 I think it is a '67 and he is playing Red House? i have not seen that clip you posted before today. where did you find that ? can you send me you email here somehow ? andy this thread has tons on facts about the sg 3. Never mind, I didn't read back far enough. Drop some photos here we like to see them. Oh my sg 3 has a regular serial number. very odd .. but it plays like butter and growls like a tiger. The pickups take time to adjust to get them right though. Sorry, no SG-3! But, here are my current SG's! Top to Bottom: '61 (Satin) SG Reissue, Kirk Douglas SG Custom, 2013 SG "Original." 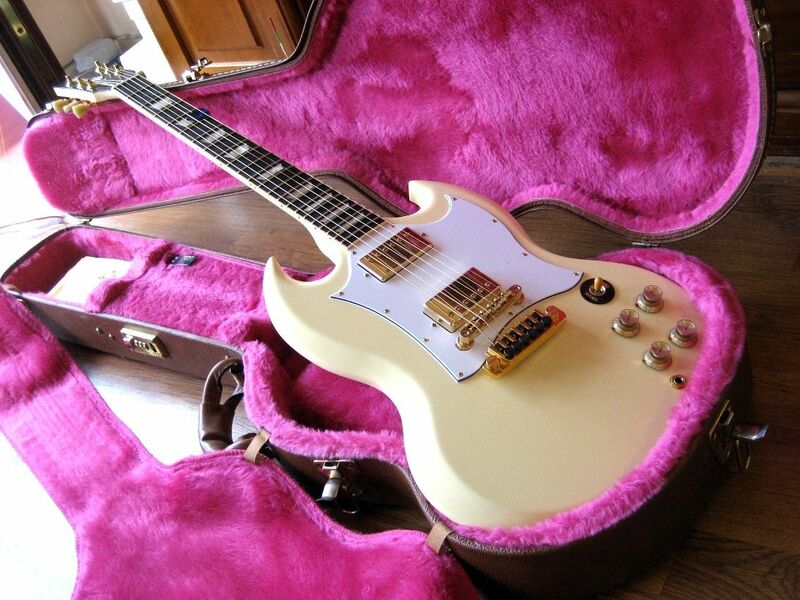 Thats a nice SG custom which is also part of this thread.. 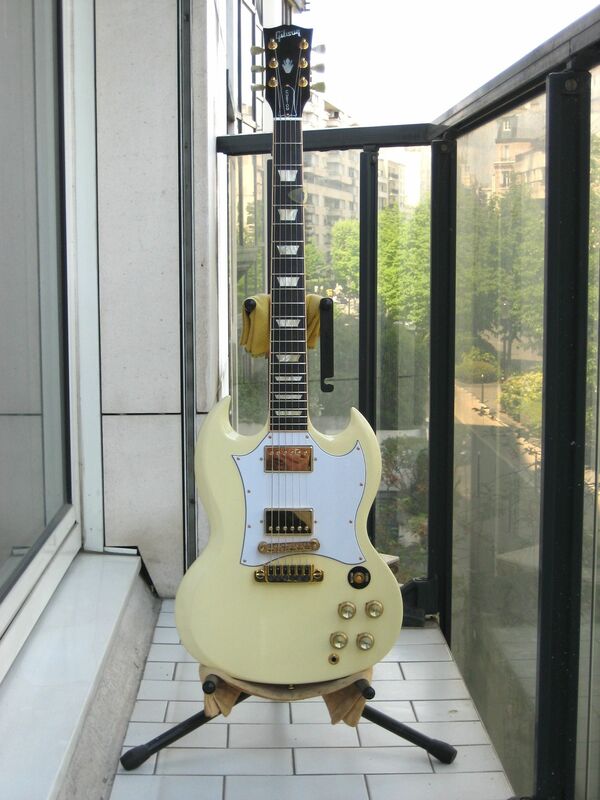 I had always wanted a custom but ended up with the sg 3 ..
That custom is real nice..can you post more photos ? You're welcome! And, you're right...it is a "smoking hot" SG Custom! Not to totally derail this thread but Charlie Brown, if you could only keep one of those SGs, which one would it be? They all look really nice. really a consideration, in this hypothetical scenario. Personally i like the three pickup versions. When you engage the bridge and middle or bridge and neck the tones are really great...The "57" pickups are one of the best in the world i think..
C.B. how many SG ' s do you have ?? a "Special" (P-90's) and "Junior" with the same beveling and horn tapering, in the near future. Otherwise, I'm "good=satisfied" with what I have now. player also had an EB-0, at one point. So, SG's are very much a part of MY "Rock & Roll"
Thats amazing because i had played when younger but somehow lost. interest and then started again about the time i bought the sg 3 and started this thread. I love the p90 sound and martin barre used( jethro tull ) and leslie west and countless others. the p90 just has that certain raw tone to it. And a stripped down version of the sg 3 but those guitars ripped and i have seen them as low as 500 on ebay...great bang around guitar as its faded. I still regret selling the one i had..
LOL, yeah, that happens. People glam onto a thread, for awhile, then it disappears. Or, they get busy, and don't post for some time. It's a very "fluid" situation, here.